Sean is the 15 year old son of Olga and Bill Gerber. He is a determined and spirited young man with two younger siblings. Sean’s episodes are triggered by excitement, temperature, fragrance and other unknown triggers at this time. Sean has the additional burden of wearing nose plugs and a face mask frequently to prevent an AHC episode brought on by pungent scents (fragrance) since this trigger causes full body paralysis that can last days and up to weeks. Although he was affected from birth, he was diagnosed with AHC when he was 1 year old. Although Sean is not able to participate as fully as other children his age, he enjoys a variety of sports during the different seasons and is among his favorite things to do. He is an imaginative young boy who enjoys playing with figures, takes pleasure participating in crafts, dancing and storytelling. Sean also enjoys spending time on the computer and iPad. Sean loves to be with other children and has a fondness for dogs and animals but his face really lights up when he is near babies and is their gentle, giant teddy bear! Sean was born at 9lbs, 3oz, 21” at birth after a perfect pregnancy. The next day he was admitted to the NICU for a week because a nurse thought he had a seizure. He had many tests done during a week stay at the NICU and all tests came back proving he was fine. At about 3 months old, he had a major episode that mimicked a seizure. We were in and out the hospitals for days and weeks at a time for a year because he continued to have these spells. After many medications and tests ran, he was diagnosed with Alternating Hemiplegia of Childhood (AHC) by a third opinion at Boston Children’s Hospital. Sean is one of the fortunate children of AHC to have been diagnosed after one year of being affected. The attacks vary with each person. An attack on my son will consist of one eye going side to side, both eyes going up and down at the same time, being paralyzed in one arm or a leg or both arm and leg and sometimes the episode will paralyze him from head to toe. When he has full body paralysis, he can sometimes communicate with his eyes. That is how I know he is still mentally with me. When Sean was younger, after each attack, it would take him a day or two to get back to the milestones he had accomplished. He is currently delayed developmentally but strides to improve each day when he is not suffering from an episode. At the age of fifteen, Sean is still not able to use utensils. He must be monitored when he eats because we fear he may choke. Sean can use an open cup to drink but still spills quite a bit. Sean is able to take off his clothes but is unable to dress himself. He still needs much assistance in the bathroom. Academically, he knows some sight words and recognizes and spells his name. At this time, he is unable to write. Sean is in tenth grade and is now attending a private special education school instead of a typical high school. At school, the focus is to continue with academics but concentrate on daily living skills and eventually community outreach. Sean has never been treated different in our family and does not know he is different. Sean has always attended a public school where he was also mainstreamed with typical peers at times. When he arrived at the new high school, he could not understand why there were so many children of different abilities and wheel chair bound. At the beginning of his transition Sean missed his friends and socialization of the typical kids as well as the younger kids at the elementary school. At times, this made him sad and/or upset. Sean has now been able to attend dances independently and make new friendships. Sean has also received numerous awards such as “Worker of the Week. Sean has excelled tremendously in his new school with living skills and maturity. However he will never be able to live independently because of his AHC episodes. Sean also has occupational, physical and speech therapy at school. He is always accompanied by an adult paraprofessional at school. Sean can walk at times but must be monitored in unfamiliar places as he does not notice objects or uneven ground. He is not able to run without falling. Sean requested a bike and received one from the Springfield JCC in April of 2012 and is finally able to pedal for short periods. This was huge a triumph for him but still gets frustrated because he cannot start pedaling himself and cannot go the distance like his younger brother and sister. Sean desperately wants to do and be a part of everything an average 15 year old can do but is physically limited. Despite his delays, Sean has always had the ability to understand adult humor and sarcasm. Sean has one of the best sense of humor and is delighted by simple things. He can even tell riddles now. Sean is extremely social, very affectionate and exceptionally thoughtful. Sean can be stubborn but it is that determination that has made him exceed. Sean enjoys being around other children very much. He has a few special friends.He used to have a couple of typical friends come to visit and play with Sean in his home.This no longer occurs since his friends are older. Due to the excitement of having his friends visit, Sean always had an episode. Sean always has episodes when he is excited. We throw a surprise party for him every year so that he is in an episode for one or two days instead of the entire week leading up to his birthday. Sean understands everything that is going on around him. He is able to converse but his speech is not always understood by persons not often around him. Sean still lacks judgment and is kept at an arm’s length. 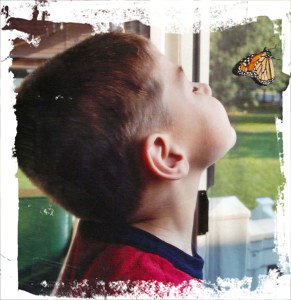 Sean has exhibited behavioral issues both at home and at school. This may be due to frustration and/or lack of being able to communicate. Sean believes he is affected with AHC because he is the first born. Sean despises AHC (who doesn’t) and wishes he was not the first born because his brother and sister are not affected. However, he is still a very loving child with a heart of gold, a contagious laugh and a smile full of sunshine.